Bord na Móna Growise Chunky Chip Bark is a premium grade bark, lasting much longer compared to other bark products. It is a highly decorative natural mulch, providing an attractive finish to beds and borders. It is also suitable for play areas. Bord na Móna Growise Chunky Chip Bark provides an easy to maintain, decorative surface for paths and recreational areas around the garden. It helps keep moisture in the soil, meaning less time spent watering, and suppresses weeds. It is certified for use in play areas. The attractive colour and appearance of Bord na Móna Growise Chunky Chip Bark provides contrast and compliments plants and shrubs, showing them to their best advantage. A mulch of Bord na Móna Growise Chunky Chip Bark reduces soil evaporation helping plants retain moisture during dry periods, and reducing the frequency of watering. 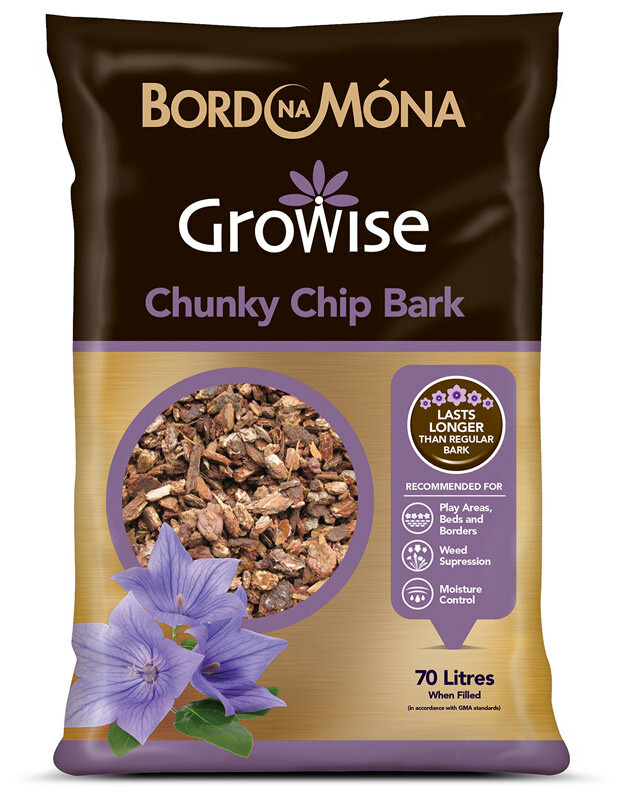 Bord na Móna Growise Chunky Chip Bark, spread at the correct depth, will help suppress weeds and reduce garden maintenance time, leaving more time to enjoy your garden. Bord na Móna Growise Chunky Chip Bark helps protect plant roots from extremes of temperature in both winter and summer. A layer of Bord na Móna Growise Chunky Chip Bark will soften the appearance of paths and other hard surfaces around the garden resulting in a very attractive finish. 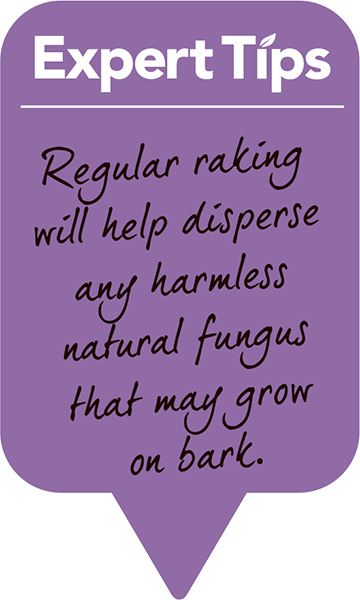 Spread Bord na Móna Growise Chunky Chip Bark by rake, to a depth of 2.5 – 5cm (1-2in). The minimum depth to give effective weed suppression is 5cm (2in). Spread generous amounts of Bord na Móna Growise Chunky Chip Bark to edge drives and paths, in play areas and to protect other heavy use areas in the garden. Apply using a rake. This bag contains enough Bord na Móna Growise Chunky Chip Bark to cover approximately 3 square meters (32 square feet) to a depth of 2.5cm (1in).